DEEP OSCILLATION® is an internationally patented, proven technology based on the effects of creating an electrostatic field in the tissue of the patient. Easy application is from therapist to patient/client via hygienic, vinyl gloved hands; utilising all normal massage movements or via circular movements over the tissue with a handheld applicator. The handheld applicator also enables self-treatment. The special structure of DEEP OSCILLATION® allows the creation of biologically effective oscillations in the treated tissue using electrostatic attraction and friction. In contrast to other therapies, these pleasant oscillations have a gentle and deep-acting effect on all tissue components to an 8 cm depth (through skin, connective tissue, subcutaneous fat, muscles, blood and lymph vessels). Because of the non-invasive, non-traumatic, gentle nature of this therapy, very early possibilities of application are possible following injury and from Day One postoperatively. Chronic conditions can also be worked upon with effective results. DEEP OSCILLATION® helps in speeding up and improving wound healing processes. Through the oedema-reducing and anti-inflammatory effect, the local metabolic elimination and alimentation are improved in all tissue layers, whereby tissue regeneration and wound closure are encouraged on many levels. This is documented by the significant improvement in planimetric and biochemical parameters of the wound healing. 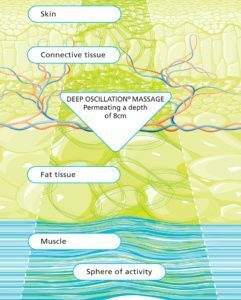 DEEP OSCILLATION® alleviates pain by reallocating and flushing out pain transmitting and mediating substances. It suppresses inflammation and oedema induced pain by restricting pro-inflammatory cell movement to the damaged area, by reducing the inflammatory mediator release, and by oedema reduction. In chronic pain syndromes and posttraumatic conditions reduced mobility often is caused by constricted microcirculation due to increased tone of the muscles encasing capillary vessels. DEEP OSCILLATION® is muscle relaxing, enables optimal metabolism and normalizing of defective nerve function. As a measurable sign range of movement can be obtained or even increased. On the level of the interstitium, DEEP OSCILLATION® causes a »Shuffling« of the basic substance, thus promoting the removal of interstitial fluid as well as content material. Interstitial septa and fissures are kept open by the mechanical activation, which helps interstitial drainage. This significantly reduces both local oedema and aseptic inflammation. Proof was also established of a significant reduction in swellings in the area of the wound, due to the treatment. In chronic conditions, the treatment helps to disperse fibrosis and to diminish hardening of the tissue. DEEP OSCILLATION® positively affects all cellular and molecular mechanisms of cellulite. It improves blood and lymph flow in the deep skin and subcutaneous layers, diminishes inflammation and oedema The girth of thighs and posterior decreases.